After a very successful career week, full of professional development and networking opportunities, the rugby club returned to the pitch excited for an opportunity to measures ourselves against superb competition. It must be noted that, due to career treks and a week with limited obligations, the club was missing several key contributors. Regardless, we were ready and willing to fight for glory, and were buoyed by the presence of alumni ruggers David Snowden (’12) and Ian Shiller (’13) in town as recruiters from Michigan-based Delphi Automotive. Red Mountain showed up in force with about 20-25 ruggers and a travelling fan base that far outnumbered the Thunderbird faithful. The club consisted of maybe 5 or 6 rookie ruggers and several large, Polynesian veterans: just enough inconsistent production to be labeled as a “B” side. 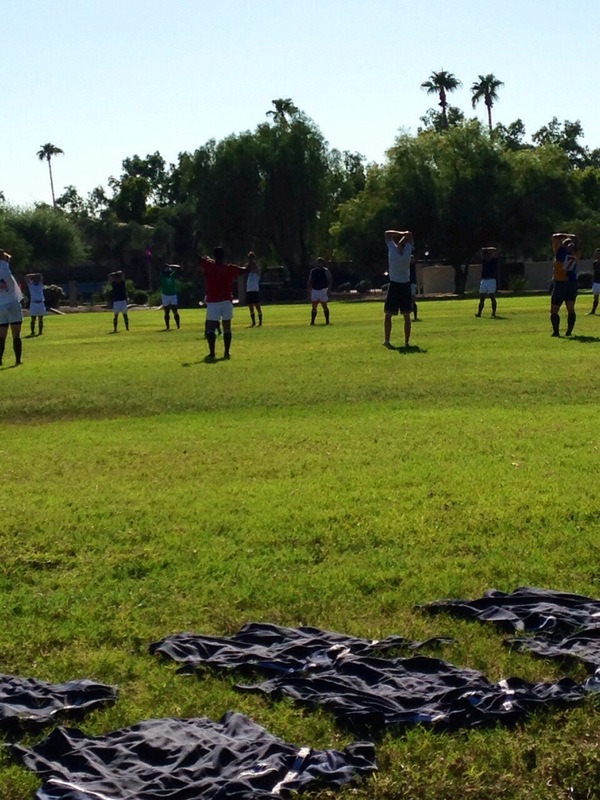 Meanwhile, Thunderbird had about 17 ruggers present, limiting our ability to substitute and testing our fitness level. 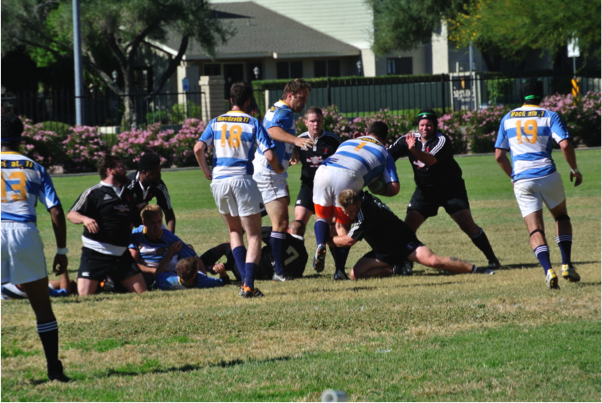 The match kicked off at noon and we agreed to play two 30-minute halves. The match began rather inauspiciously as both squads struggled to gain momentum. 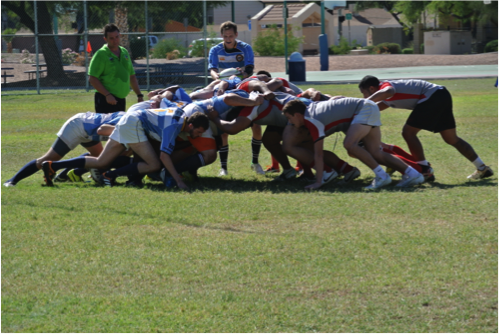 Field position was key, and after some fundamentally sound rugby that included several winning scrums and lineouts, Thunderbird took the as President Jay Stahlman jumped on the ball after a penalty, took a quick restart, and dove in for a try between three Red Mountain forwards. At halftime, the score was tied at 5-5. The second half was a war of attrition and ultimately the size and strength of the visitors prevailed. Thunderbird’s discipline and cooperation made it a very close competition, much closer than I think a lot of people were expecting, but ultimately a tired squad fell to after conceding a try in the last five minutes, losing 22-15. At the end of the day, it was this match was a fantastic learning opportunity for the squad and a great confidence booster. The team now knows that by playing together and supporting each other, we can compete with even the top teams in the valley. 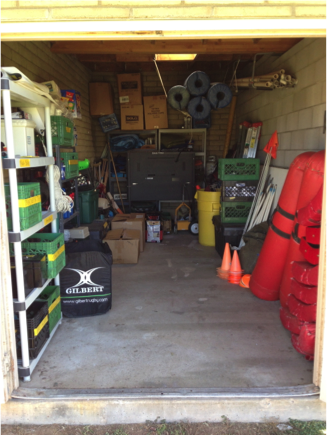 This next week will be used to prepare for the annual Halloween fundraiser party, followed by the Thunderbird Rugby Invitational on November 9. SAVE-THE-DATE – Halloween Bash 2013! 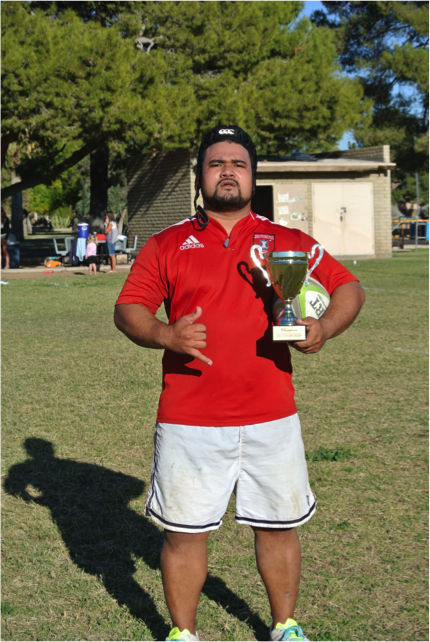 GOGOs and the Rugby clubs are excited to co-host the annual Halloween event this year. Find your costumes and mark your calendars today! Join the T-bird community for the best night of the fall trimester! Please extend the invitation to spouses and friends. 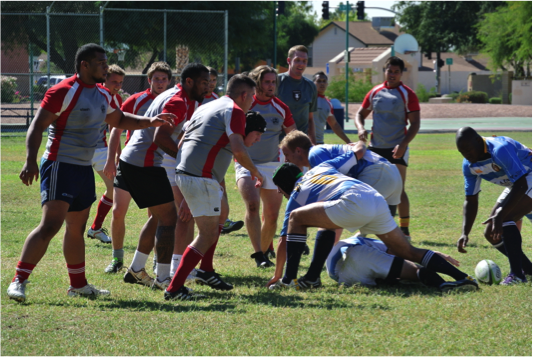 ​On a beautiful Saturday afternoon, the Thunderbird Rugby Football Club kicked off the Fall 2013 season with a friendly intra-squad scrimmage. 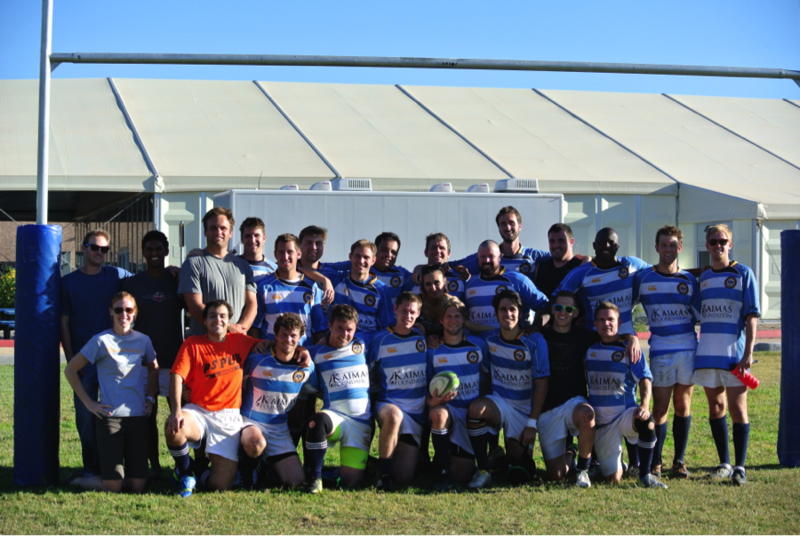 In all, 38 ruggers turned out after exams to compete, allowing us to play three 20-minute periods of 15s rugby. 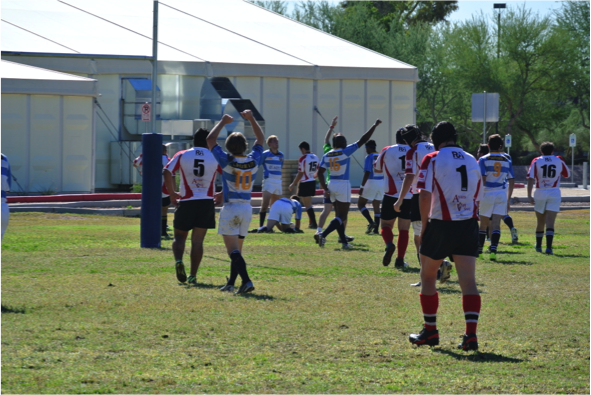 Learning was the theme of the day as the match provided roughly 60% of the club with their first rugby game experience. As one may expect, tackles were a bit high and rucking was a bit sloppy, but the most common refrain following the match was how much the new blood enjoyed the experience. 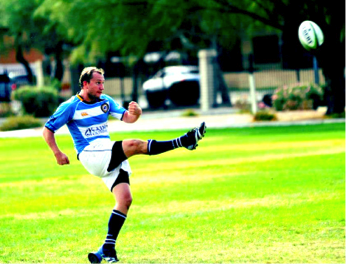 All veterans know that rugby is a sport you learn by playing, and there was certainly plenty of playing time to go around. The outcome, while rather insignificant, was a 33-21 victory for the Blue squad over the White squad. After jumping out to a quick 10-0 lead, the white squad began to fade as injuries and lack of conditioning took their toll. Some quick thinking by veteran players Oliver Holmes (UK) and Steve Preator (US) helped the blue side storm back to take the lead 21-10, before the two sides traded tries to finish out the match. Following the match, the club and some select supporters went over to the Fish for a social event consisting of hot dogs, adult beverages, music and good company all compliments of the rugby club. 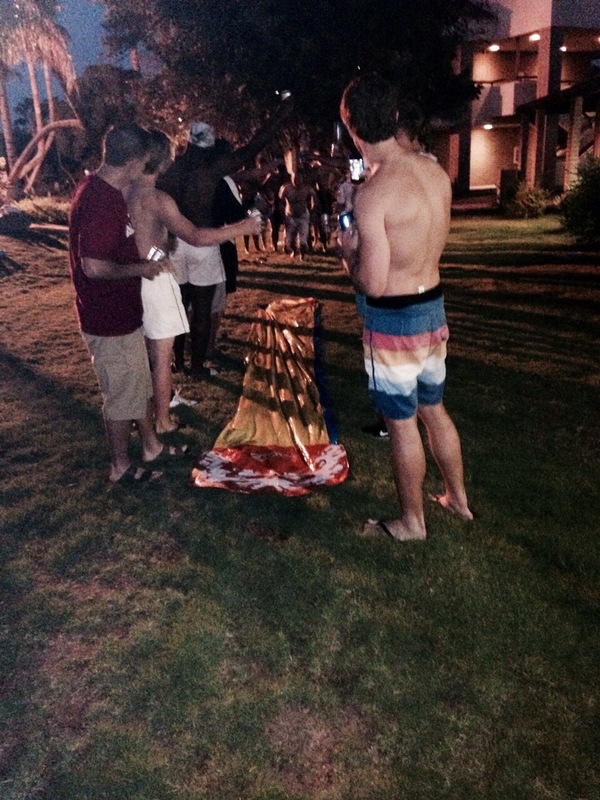 At the social event, new ruggers were initiated as official TRFC members with the classic Beer Slip’n’Slide, followed by a quick jump in the pool and some good ol’ rugby songs late into the night. Also at the event, each team announced their man of the match: veteran back Ryan O’Neal for the victorious Blue squad and newcomer forward Bryce Jahner for the White squad. 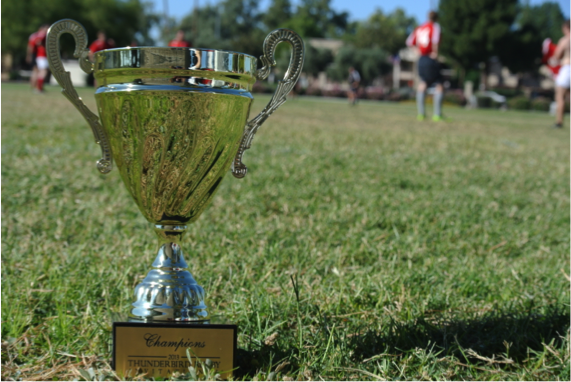 The club’s next opportunity to test their metal on the pitch comes on October 5 at the Flagstaff 10s tournament where the club is considering entering two squads, depending on turnout. 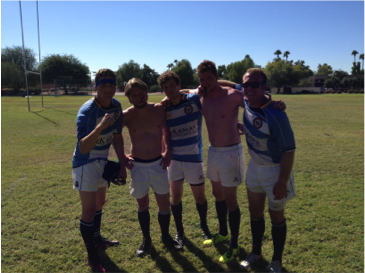 Allocate $21 and the club will provide your own rugby shorts and socks (a $30 value)! We look forward to seeing you on the pitch!! !